Every minute is crucial to save lives and reduce the severity of injuries when emergency services are called to a road accident. Yet people injured in an accident do not always have the reflex or the physical ability to call emergency services immediately. eCall devices address this problem by alerting emergency services immediately even if the driver or passenger is unconscious or otherwise unable to call. eCall refers to an interoperable in-vehicle emergency call service introduced to be operated across Europe. It is foreseen that eCall will be offered on all new vehicles in the EU by 2015.
eCall provides reliable full-duplex data communications in addition to the emergency voice call (E112) via the cellular network. 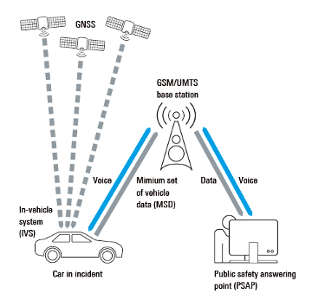 More precisely it is a manually or automatically initiated emergency call in combination with the transmission of a minimum set of data (MSD) from in vehicle system (IVS) to the public safety answering point (PSAP) via the voice channel through cellular and public switched telephone network (PSTN). The MSD includes, for example, vehicle identity, location and time-stamp information. Testing either the in vehicle modem or the whole system performance requires multiple test functionalities. Rohde & Schwarz offers a comprehensive test portfolio for eCall covering both the mobile communication system towards the IVS as well as the generation of satellite signals. The GNSS simulator supports all possible scenarios, from simple setups with individual, static satellites all the way to flexible scenarios generated in realtime with up to 24 dynamic GPS (C/A and P code), Glonass and Galileo satellites.